Reuters reports that in a quiet corner of the Afghan capital, dining tables are covered with traditional fabrics, a man on the piano plays Frank Sinatra, and expatriates munch on food that can usually only be found back home. Unlike other restaurants catering to Afghanistan's large expatriate community, the Afghan Garden Kitchen employs a cadre of all-female chefs -- teenage Girl Scouts from broken homes. "For children who may not have a father or a mother at all, we've got to find a solution where they can go and work, they're protected in their work and not forced into marriage by their families or because of their circumstances," said Marnie Gustavson, head of the non-governmental organisation Parsa that runs the scout program. Since the austere rule of the Taliban was ended by U.S.-backed Afghan forces in 2001, women have won back hard-fought rights in education, voting and work in Afghanistan. The Afghanistan Scout Association was officially founded in 1931 in Afghanistan by a royal decree. The site of Robert Baden-Powell's second posting in 1880, Afghanistan was a member of the World Association of Girl Guides and Girl Scouts from 1932 until the Afghan government dissolved the Scout Association in 1947. 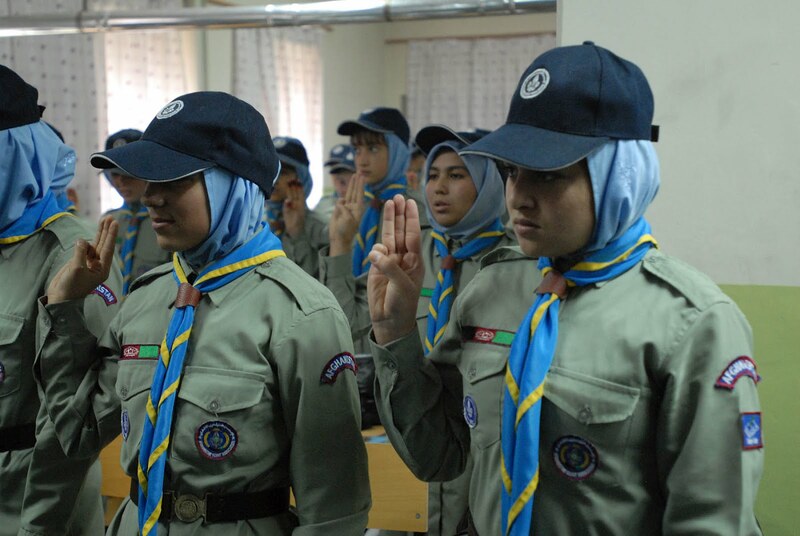 Afghan Scouting was formed again from 1964 to 1978 and recognized by the World Organization of the Scout Movement. Their plight, however, remains severe, and jobs and lives are still restricted by custom and law. 13-year-old Zakia Shawbi moved from Kapisa province north of Kabul to the capital five years go because her drug-addict father could not support his eleven-member family. Now she earns $20 a month, receiving orders, learning recipes and cooking -- vocational training for later in life that is part of a scout program which began in Afghanistan in 1931 and was resurrected years after the fall of the Taliban. The dire treatment of women was the main reason Western countries gave for refusing to recognise the Taliban government as legitimate. It also caused the amount of foreign financial aid Afghanistan received to shrink significantly. The United States and NATO, who have been fighting Taliban insurgents for 10 years in an increasingly unpopular war, have repeatedly stressed that any peace talks must abide by Afghanistan's constitution, which says the two sexes are equal.